Heterolanthanide clusters Nd2LnI5(S3)(S2N2)(THF)9 (Ln = Dy, Yb) are synthesized by the reactions of (NdI)3N2 with DyI3 or YbI3 and sulfur in a THF solution. X-ray diffraction analysis revealed that the structure of the complexes is similar to the structure of Nd2LnI5(S3)(S2N2)(THF) 9 obtained earlier (Ln = Tb, Tm). The ion Dy3 + in the molecule is coordinated by the iodine atom, the S2 group and the terminal N atom in the resulting S3N2 ligand. Cluster Nd2YbI5(S3)(S2N2)(THF)9 of the same structure was obtained as well when YbI2 was used instead of YbI3. Possible pathways of the reactions are discussed. UV excitation of Nd2DyI5(S3)(S2N2)(THF)9 causes low-intensity emission of Dy3+ ions: two bands at 480 and 580 nm. 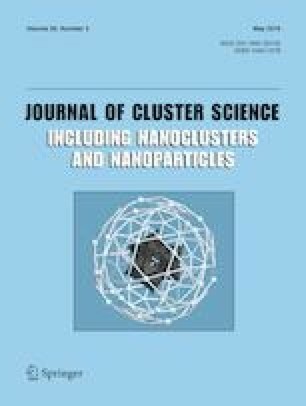 Magnetic measurements showed no exchange interaction in the obtained clusters. The online version of this article ( https://doi.org/10.1007/s10876-019-01552-5) contains supplementary material, which is available to authorized users. This work was supported by the Russian Foundation of Basic Research and the government of the region of the Russian Federation, Project No. 18-43-520002. Authors thank Dr. N. N. Efimov (IONC RAS) for magnetic measurements at low temperature.